After failing to craft a suitable competitive Azindel deck in my January 2019 quest for Masters rank, decided to try a half-dozen ETS Tournament deck lists and give them each a 20 game trial. 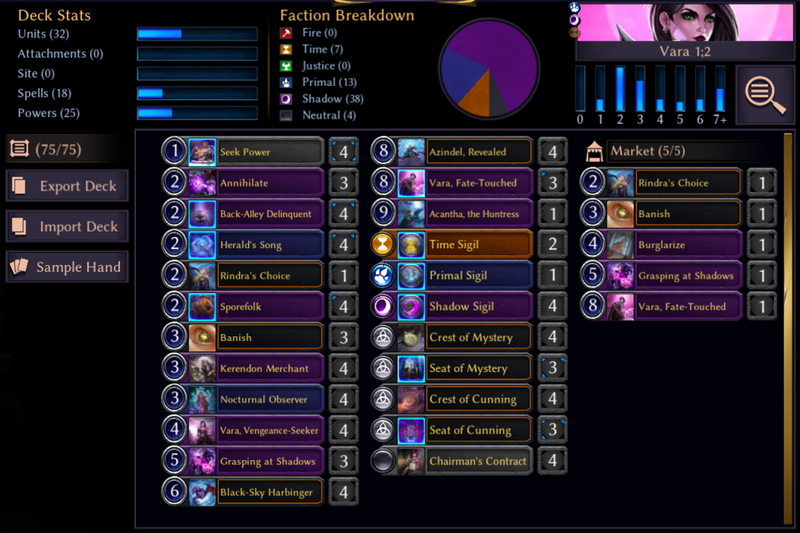 At the time I lifted these lists, I had no knowledge of how these decks performed -- I saw the deck list share on the Eternal Discord and on a free moment Saturday morning, imported some deck lists. There were several more that I didn't have the cards for but would have liked to try -- like, for instance, camat0's "Chainbrei" Martyr's Chain build. As I finished this account here, went & looked up the ETS records for the players piloting these decks. None of them were in the top 8, though Grimfan finished at #14 with a very formidable 5-2 mark. The 2 decks that performed best for me did not win a single match in last Saturday's tournament. At the end of each deck report log section, I appended the originating tournament player & record. Listed below are the 6 decks I piloted, with my 20 game record included in the heading. Actually, went 10-11 with this, as forgot to change decks in deck selection screen when wishing to switch over to Kerasaurs deck. Deck can be a little tricky to pilot and I think Mask of Torment is overshadowed by Martyr's Chains and Pit of Lenkekta. Those decks outvalued this one and I didn't have enough relic removal or have it in timely spots. The most polarized deck of the lot here -- games finished quickly, even more quickly than aggro decks I've played in past. 42 Units, 3 Spells (Xenan Initiation) and 30 Power. I either smashed opponent by turn 6 or a poor draw doomed me. One memorable game, opponent plopped down Rolant, the Iron Fist for which the only answer in the deck was in Market cards Purify & Passage of Eons. And of course, no merchant in hand nor did one surface in subsequent draws. Deck was also weak to Deadly units. Especially when in combo with Killer. I admit that this deck no doubt suffered from a lot of operator error. But, still, I seemed to struggle amassing power, maybe not so much ramping into power, but drawing influence requirements. When deck clicked, it was beautiful, but too often I just was holding the wrong mix of cards in my hand. Also, it didn't help that during this run I ran into a big pocket of opponents brandishing aggro decks. Even worse, I think I drew Calderan Cracle in only a handful of games. This seemed to be the strongest of the 6 decks here -- I believe I started out 11-1 with it. It just overpowered opponents, and Grasping at Shadows (even without Vara, Fate-Touched) bringing back Tavrod or Vara, Vengeance Seeker was too mcuh for opponents. And Sabotage from Back-Alley Delinquent (or Regent's Tomb, which was a popular Market swap for me) dented opponent gameplan. Then I ran into some bad draws and a bunch of Harsh Rule decks that seemed to trump this. Turn 5: play Grasping at Shadows and then delight in the board being field with Vara, Fate-Touched, pulling Azindel, Revealed, with Vara Vengeance-Seeker and even another merchant or Black-Sky Harbinger. Once, I had Vara, Fate-Touched pull another Vara Fate-Touched and it filled my whole board and opponent quickly hit Concede. But that was predicated on Sporefolk, Nocturnal Observer, Chairman's Contract in earlier turns and getting these powerful units in the Void pool. Otherwise, deck could struggle. The deck that I finally reached Masters rank with. Had a good mix of fattie units & removal spells. All of the games with it seemed close, only really got flattened by Harsh Rule decks. Just looking at list, doesn't seem spectacular and way less powerful than the Kerendon Reanimator deck that also posted a 13-7 run. The cumulative win percentage mark for these experiments wasn't exactly stellar -- 61-59, a rather mediocre 50.8% clip. It gets a little better if I take a mulligan on the definintely abysmal Moment of Memes deck run (55%). The 120 games, with the exception of the final game, all happened in Diamond ranks as I advanced into Masters rank on the penultimate matchup. I do not think there has been a more varied meta landscape than I experienced in these deck trial experiments -- I believe I faced the most varied gamut - at least at Diamond rank level - that I can ever recall. 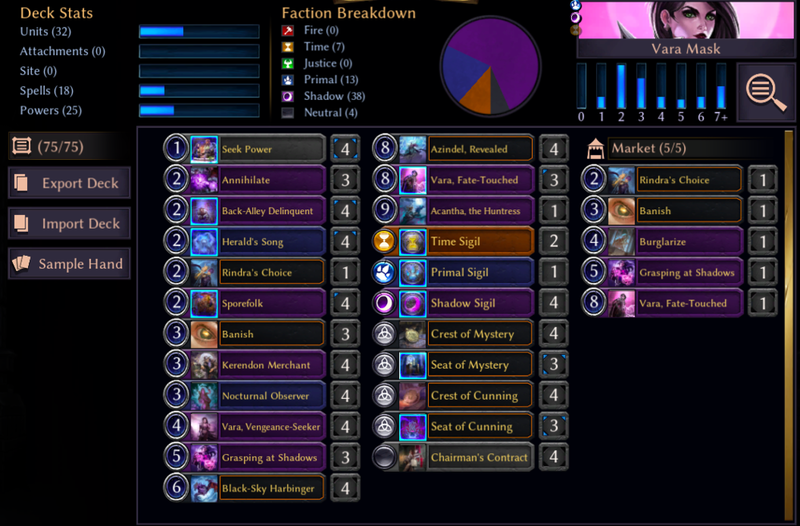 Aggro decks in Rakano, Skycrag and Stonescar flavors, Grenadins, Kennadins, Sentinels, "Big Relic" (Martyr's Chains, Pit of Lenetka) decks, Hooru flyers, Haunted Highway, Big Xenan, Wisp Xenan, Howling Peaks, Mono Time, etc. Even players experimenting with cards like Factory Quota. Perhaps because the meta is still in a post-patch honeymoon period, but I like it when meta is such that you never know what you're going to queue into. Now let me get back to crafting that competitive Azindel deck. Or maybe I'll try my luck with Sentinels.